A borrower who doesn’t reimburse the loans is obviously the greatest risk when investing in P2P loans or through real-estate or business crowdfunding. In this article, we’ll examine the possible outcomes, based on real-life situations. Most P2P lending platforms offer loans covered by a buyback guarantee [?]. If the investor is late, the investor is reimbursed the principal and accrued interests after a given delay (30 or 60 days). This delay varies from one platform to another; here are the buyback trigger delays and coverage for several platforms, as of July 2018.
nominal value of outstanding principal, plus accrued interest income. outstanding principal of the claim and accrued, but not paid interest. I’ve repeatedly pointed out that the buyback guarantee isn’t an absolute guarantee. Indeed, the originator itself may end up in financial troubles, in which case it won’t be able to honor the buyback guarantee. This happened with one of Mintos originators called Eurocent. The consequences for the investors are still unclear, as is often the case when judiciary action is triggered. However, it’s unfortunately likely that the investors will suffer losses. The best way to prevent large damages to your portfolio is to spread your portfolio between different originators. You may also want to investigate the originators themselves. For those who want to dig further on the topic of Mintos originators, there’s an excellent article at Explore P2P, comparing them in depth. Also, Mintos started rating their own originators, giving you an idea of how risky it is to invest with them. And as a final note on this topic, Mintos’ auto-invest allows you to automatically diversify your investments through the available originators. Omaraha guarantees that if the borrower defaults, at least 60% of the remaining principal will be reimbursed to the investor. The exact percent depends on the current level of the warranty fund. 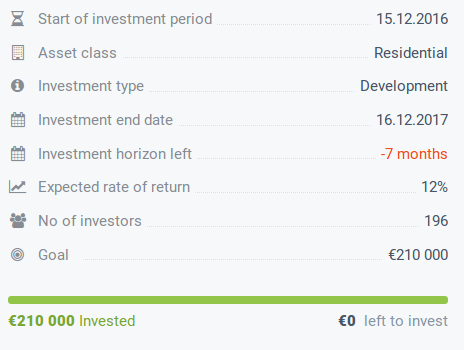 As I’m writing this article, the amount available in the warranty fund is slightly above €46 000 (this fluctuates daily); I actually expected a larger amount. This fund is paid for by borrowers, as Omaraha collects 3% from loan amount. This will work as long as there will be new borrowers, and if the default rate stays stable. Overall I was compensated 70% of the total defaulted loans amount. EstateGuru‘s loans aren’t covered by a buyback guarantee. In spite of the rigorous project selection, the borrower may fail to make a repayment. It happened for the project named Toome avenue development. The borrower was supposed to repay the principal on November, 3rd 2017 but didn’t. One month later, on November 14th, 2017, EstateGuru started the process of selling the collateral. And one week later, on November 21st, 2017, the loan was repaid to investors, including interest, overdue charge and indemnity. This lucky ending is of course not guaranteed; however it shows that a borrower’s default doesn’t always lead to a loss for investors, even if the loan didn’t come with a buyback guarantee. EstateGuru featured a short blog post on the collateral’s sale. In the case of this CrowdEstate project, the borrower didn’t even make its first interest payment (!) on March 20, 2017. Unfortunately for the investors, the enforcement proceedings seem to take forever. While the project’s page features many updates, they may have left many investors frustrated; indeed, the proceedings are still ongoing, and currently the investors are kind of left in the dark regarding the future of their investment. As I’m updating this article in December 2018, the mortgaged collateral still couldn’t be sold ! The next bankruptcy hearings are planned for February 4, 2019; we’ll see if investors finally get their money back at this point. Month after month, I’m reporting decreasing returns from my Bondora portfolio. The main culprit is a high default rate, coupled with a low recovery rate. However, my earliest defaulted loans started to yield some money from the recovery process, as they finally moved to the bailiff stage. It overall took more than 6 months after the default occurred !